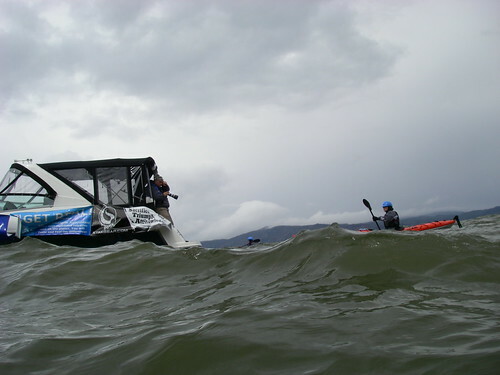 Some months back, Columbia River Kayaking was contacted by one of the organizers of Eco-Challenge 2008 and asked to participate in this event. Eight lovely sports models were going to bicycle down to the river from Mt. 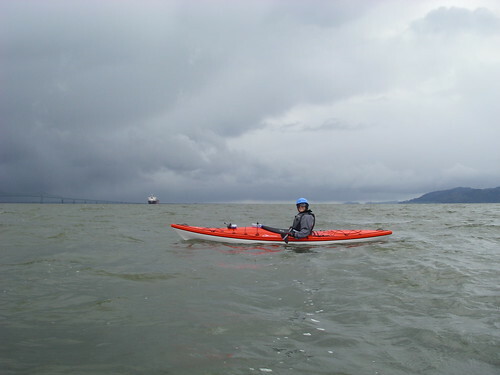 Hood and then kayak to Astoria, ending the trip on Earth Day weekend, supposedly raising awareness about environmental issues along the way. And of course, looking really cool in their kayaking and biking gear. Anyway, this was supposed to be an event that would be handled by one of the female members of the company, but in the end, she wasn’t able to get away from her other job in time, so I took it on instead. 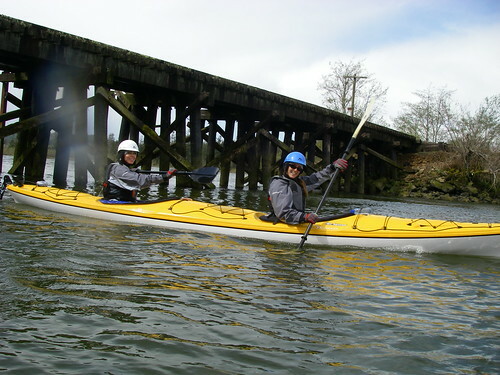 Last Saturday, Katie and I drove to Troutdale to give the girls a quick kayak safety lesson before their journey started the following Tuesday. Unfortunately, I wasn’t able to get them in the gear and in the water for a real kayak safety lesson and we had to settle for a lecture on dry land. 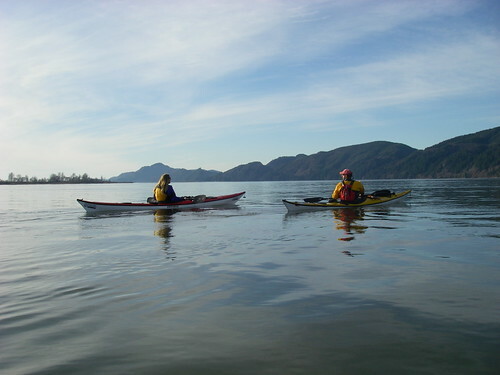 We agreed to paddle with them on the last day of their journey, which was to be from Svenson Island, around Tongue Point and ending at the Maritime Museum on the Astoria waterfront. There were a few critical things wrong with the plan, though. 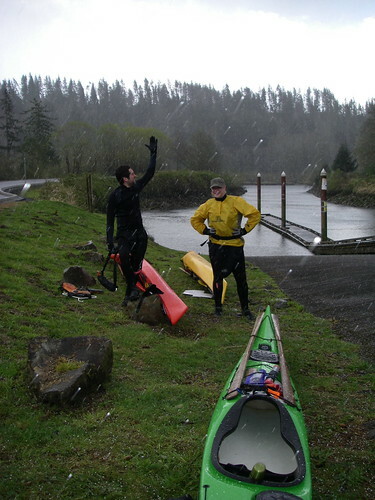 They were set to start out paddling downstream at 10 AM, against the incoming tide. Ideally, if one has to round Tongue Point at all, one would want to do that at a slack tide, when there is little water movement to kick up waves and clapotis. And of course, it would be better still to paddle with some help from the current rather than against it the whole way. At the last minute, the weather report – snow, hail and wind – forced a change in plans and I was told we would be starting out from the John Day boat ramp, much closer to town, and at 9:30 or so, which would have lined up with more favorable tides. Alas, that was not to be. Katie and Josh and I arrived at the boat ramp at 9:15, after a harrowing morning which involved my new Subaru blowing a head gasket while crossing the Astoria bridge and a made-for-the-movies zip through town trailing steam all the way. We left my car at the Maritime Museum, and moved the kayaks onto Josh’s roof rack-less Geo and decided, incorrectly, that we were running too late now to stop for coffee and carbohydrates. 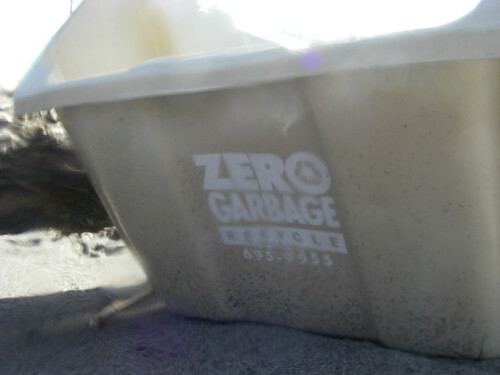 We got to the boat ramp and found no Eco-Gals had arrived yet, so we geared up and set to waiting. In the hail and snow. The Eco-Chicks and their entourage finally showed up around 10:30 and spent close to an hour getting ready to get on the water. Check out the Ugg boots on one of them. When I took this picture, I didn’t even notice that. I had assumed and been assured that the girls were getting good gear to paddle in and I just left it at that. That was a mistake, but there was probably nothing I could have done anything about it anyway. It was close to 11:30 before they were all in their kayaks and we moved out of the boat ramp into the John Day River, accompanied by a giant powerboat provided by FMC Watersports in Portland, loaded with organizers and photographers. The girls’ boats all had little waterproof video cameras mounted on them as well. I sure would like to see some of that footage! 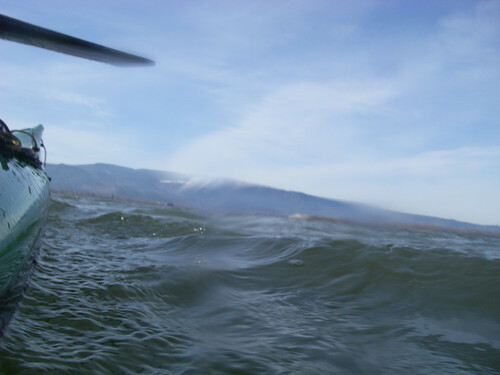 We paddled out of the John Day and into the Columbia and turned left towards Tongue Point. 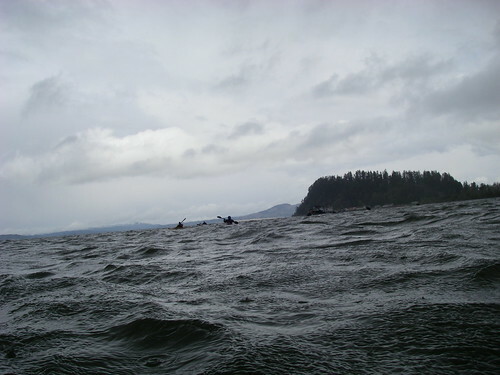 There was a bit of a breeze coming through the gap behind the point and some of the paddlers were having a hard time tracking straight in the wind. I realized that several rudder pedals were not adjusted properly and when I went to fix one of them, I realized that the mechanism was totally broken. So as soon as I was able to find a good beach, I pulled the whole crew up on dry land and ended up removing the broken rudder and stowing it inside and adjusting some more footpegs. At this point, we realized that the girls were already getting tired and hungry and had almost nothing in the way of snacks. “Oh, they gave us some Redline energy drinks,” one of them said. So we gave them all of our granola bars and a banana and got everyone back onto the river just behind Tongue Point. Note to interested parties: Energy drinks are not adequate fuel for intense exercise! Tongue Point is a large basalt ridge, poking out into the Columbia River just upstream of Astoria. When the river hits this obstruction, flooding or ebbing, it creates standing waves, claoptis and generally turbulent water, even on a calm day. When wind is added to the mix, it gets even more exciting. Lewis and Clark were pinned down here for days by the wind and waves. 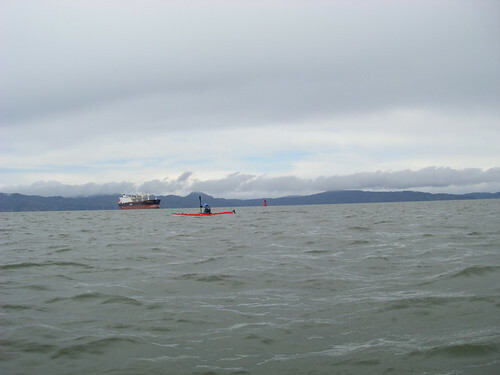 It is not a place for beginners to paddle kayaks. Which is exactly what was going to happen next. There was probably about a 15 knot breeze blowing and whitecaps all around the point. We gathered everyone together, gave some last minute tips and around we went. I think it probably took over 45 minutes to come around and get clear of the tidal turbulence. All along the way, the boat was right in front of us, with cameras clicking away. I’m sure some excellent photos were taken, but none by me. The lens on the little Pentax was continually wet and it was totally impossible to get a shot that included a horizon that didn’t slope to one side or the other. You get the idea, though, looking at the picture above. It was pretty lumpy water. But we got around the point without incident; everyone was still upright and some were even smiling and talking about how beautiful it was. Good attitude! But some of the girls were starting to get truly exhausted. All the training and gym workouts in the world had not prepared them for this kind of work. And of course, a granola bar and an energy drink was not anywhere near enough real fuel to keep up this pace for as long as we needed to. We were still almost three miles from the end point, having traveled less than half of the distance so far. We were starting to get spread out as a group and there was a pretty serious looking front approaching. 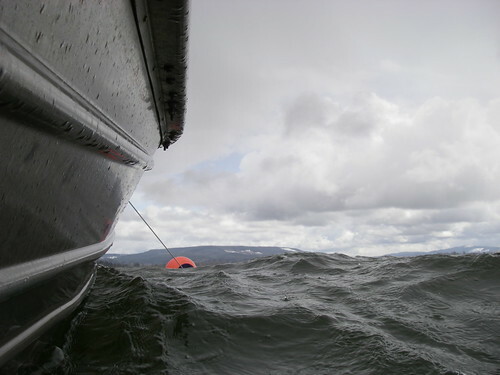 The current was nearly one knot against us, so every time anyone had to stop for any reason, we lost ground quickly. As the rain was just starting to hit, I took these two pictures in quick succession. The first one is looking back towards the point and the trailing end of our little parade. The next one is about a minute later, looking ahead. Then the wind hit, and things really fell apart. 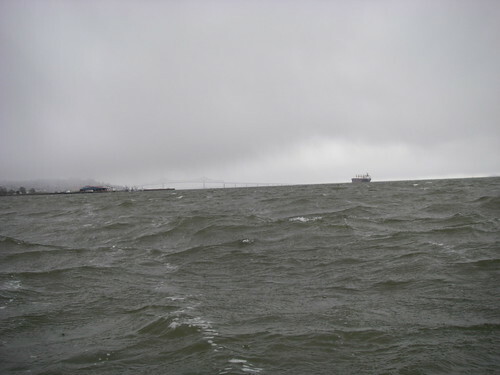 I guessed the windspeed at about 25 knots or so, and it was filled with stinging rain. I was pushing on ahead with one of the girls nearby when I looked back and saw a kayak upside down. I turned around and went back and made the paddler with me come back too, just so she wouldn’t be alone. 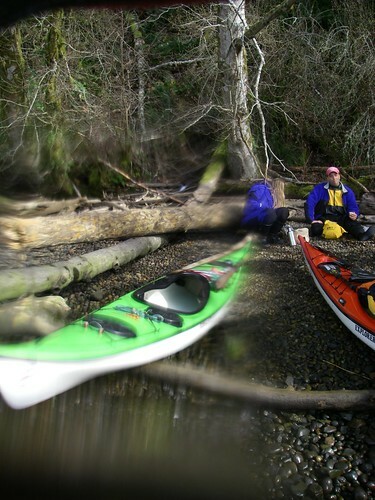 When I got there, there was gear all over the river, the paddler had let go of her boat and was hanging onto someone else’s boat and one of the other girls had the empty boat with her and was getting blown upstream towards some pilings. What a train wreck! I sorted that out while Katie gathered up the gear; Josh was already towing someone so he was kind of pinned down. I got the empty boat back to the girl in the water, but it wasn’t quick or pretty. She had been in the water for at least a minute by this time. Brr! When I heaved her up on her boat, I realized that she had on only a thin pair of nylon pants, no neoprene and no polypro of any kind! Yikes! She was totally freaked out, did not (!) want to get back in the kayak and she was quickly picked up by the support boat. I didn’t realize until the end of the trip that she was the one wearing the Ugg boots. Note number two to interested parties: Ugg boots are NOT paddling gear! Katie and Josh regrouped most of the rest of the gang and kept going so we wouldn’t end up going back around the point again, backwards. And in quick succession, as I checked up on two stragglers, they both opted out and were picked up by the boat. I think I paddled the stretch of water in front of Alderbrook five times by the time I caught up with the group. We pulled into the east mooring basin behind the seawall with the survivors and took a well earned rest. We shared the last granola bar amongst the seven of us that remained and finished the rest of my tea ( I am going to buy an extra thermos for days like this!) and then headed on towards the museum. When we popped out into the river again at the west end of the seawall, it was starting to get sunny and the river was calm enough that what we had just been through seemed almost unreal. This was the last picture I took that day. Shortly after, we pulled up to the museum’s dock to the applause of the few folks who were waiting there. We each got filmed briefly for our comments, then we got the heck out of there, and headed up to the Fort George Brewpub to decompress and relax. And I had the first food of the day that wasn’t a granola bar. At four o’clock! In a few minutes, I am going to get up and go over to Astoria with the car hauler trailer and pick up the Subaru. I’ve already been shopping for an engine. I guess my bad car luck wasn’t over yet after all..
What a long post! I hope that some of you get a chuckle or two out of it. I know a few people have been waiting for this entry. Well, it’s that time of year again, when the first big salmon fishing event of the calendar year happens, and right at my proverbial doorstep. Columbia River spring Chinook is what I’m talking about. Starting in early March, the first few spring Chinook start making their way into the river. In a “good year”, by mid-April there will be more than a thousand a day crossing the fish ladders at Bonneville Dam. The first year I started fishing for springers was a “good year”, and I learned enough to be able to hook a dozen of these amazing fish that season, but I only landed one, a native, on the last day. The natives cannot be kept in the springer fishery, so that one went back in the river. That was in 2004. The next year, I managed to catch and keep this one. I think it was the most beautiful fish I’ve ever seen. This was the only springer I’ve ever managed to keep. I lost two last year, one to a crafty harbor seal. Springer fishing is famous for consuming one’s life, gobbling up hours of river time, gasoline and tackle and rarely producing a fish. My friend Brian at Cape Falcon Kayak told me he doesn’t believe springers actually exist. Still, this has got to be my favorite fishery, for a lot of good reasons. The easiest to understand is that it is literally in my backyard. 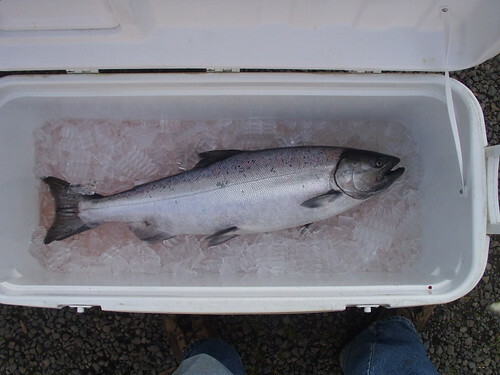 I live 3 miles from the river, at one of the most popular springer fishing areas, between Cathlamet and Skamokawa. So it is really easy and cheap for me to fish here. I can tie up my boat at the kayak center dock and leave it there all season, avoiding the hassle of launching and retrieving the boat every day. I can get out and fish for a couple hours whenever I can spare the time. It is a wonderful time to be on the river, as the weather is unpredictable and can provide anything from snow to rain, frost to sunshine, with a liberal helping of rain. I love it. And of course, if you ever do catch a springer, it will make all those hours worthwhile. They really are the best eating salmon. 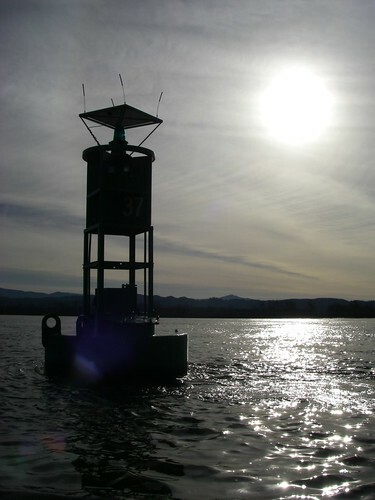 There are two primary techniques for springer fishing: trolling and anchoring. When I was first starting out, I preferred to anchor up, since there was less hassle with changing depths and dodging other river traffic. Nowadays, I like trolling better, as it at least feels like I am doing something by moving around over different territory, and you can see more of the rest of the fleet and see how others are doing. It’s a little more social. Both techniques involve a spreader and a cannonball weight of 3-6 ounces on a 2-3 foot dropper. 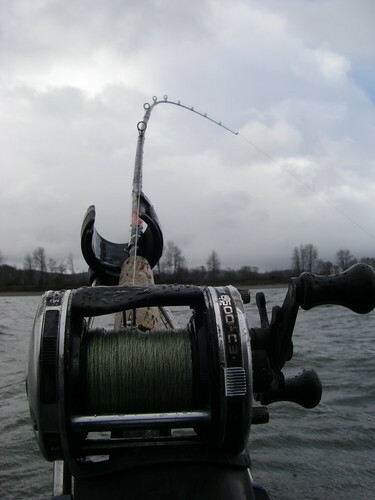 For trolling, you add a rotating flasher of some kind, and a mooching rigged herring on a 40# leader. Use a shorter leader, maybe just a couple of feet, for cloudy water, and a longer leader for clearer water. Tweak the herring so that it spins in circles as you tow it through the water. The tricky part is keeping this rig moving along just off the bottom. The depth is constantly changing and if you aren’t near the bottom, you aren’t really fishing. If you are too close to the bottom, the weight starts bouncing and tangles your gear, and again, you aren’t really fishing. 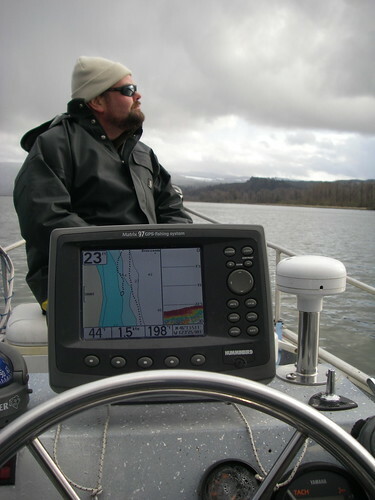 This takes constant checking and adjustment and it helps to have a good depth sounder so that you know where the bottom is. Generally, you want to be in 15-30 feet of water. 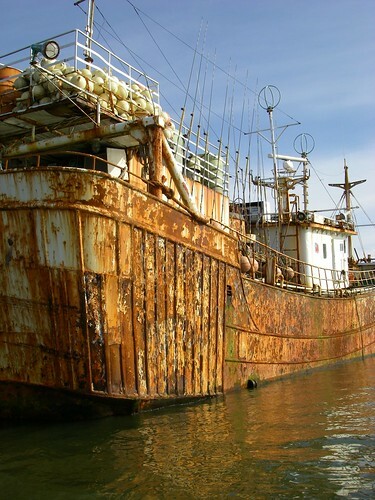 For anchoring up, you also want to be in that 15-30 feet deep water, preferably right next to an underwater drop off, so that your gear is fishing right near an underwater “wall” on one side. The fish will tend to travel next to these walls. 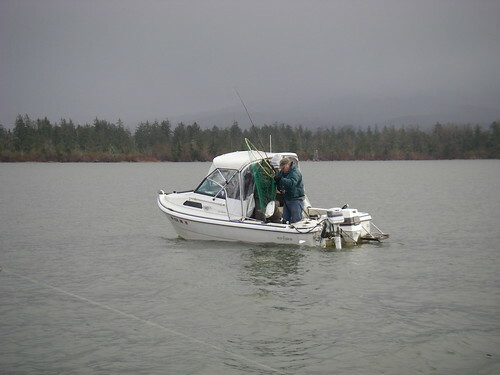 This technique is utilized mostly on the ebb tide, so that the outgoing water holds your gear right in the path of the fish as they are travelling upriver. 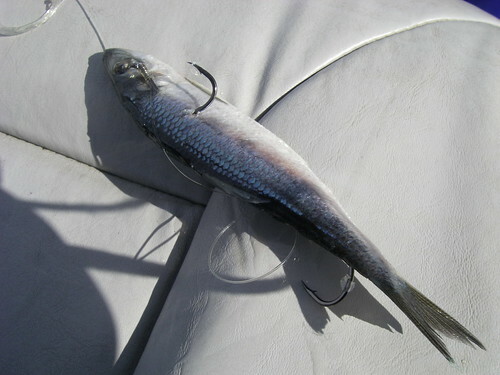 You can use the herring rig for this, but most folks use a wobbling lure or spinner of some kind. Luhr Jensen’s Kwikfish is a popular choice, or a Brad’s Wobbler, or you can make your own spinners. Either method you use, you will do a lot of waiting for something to happen. This year, the season in this part of the river was very short, only ten days. I was working for part of it, so I only went out six times, for a few hours each. I didn’t get so much as a bite, and even when surrounded by as many as 40-50 other boats, I only saw a few fish get caught all season. No matter what the DFW says, the fishing down here was absolutely terrible, even by spring chinook standards. But even if there are only a few fish being caught, that still means somebody is going to get lucky. Today, on the last day of the season, these guys managed to catch a keeper right as I trolled past them, and I managed to get quick picture as they hauled it aboard. And that was as close as I got to a spring Chinook in 2008.